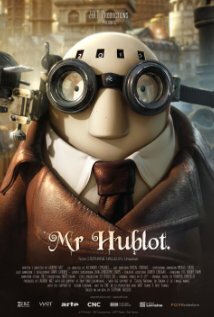 Mr Hublot is a Luxembourgish/French animated short film by Laurent Witz and Alexandre Espigares with/after the characters of Stephane Halleux. It won the Academy Award for Best Animated Short at the 86th Academy Awards on 2 March 2014. Mr. Hublot sees a tiny puppy-like robot shivering in a box. When the box is taken away for garbage disposal, Mr. Hublot, concerned for the puppy's welfare, takes the robot to his house. The robot gets bigger and bigger and is soon much bigger than Mr. Hublot. After the creature causes extensive damage to the apartment, Mr. Hublot appears to attack the creature, which seems suddenly frightened, with a screwdriver. After some time has passed, Mr. Hublot is shown in his home, with everything returned to normal. To the surprise of the audience, it is revealed that, far from destroying the creature, Mr. Hublot has instead moved from his tiny apartment to the warehouse across the street so that he could accommodate his oversized pet. They both seem happy and Mr. Hublot continues to turn the lights on and off before leaving the room. Mr. Hublot original music "Robotpet" and "Mr.Hublot" performed by Li-lo. ^ "2014 Oscar Nominations". Oscars.com. 16 January 2013. Retrieved 4 February 2014. William Hal Ashby was an American film director and editor associated with the New Hollywood wave of filmmaking. Bunny is a 1998 American computer-animated short film by Chris Wedge and produced by Blue Sky Studios. It was featured on the original DVD release of Ice Age from 2002 and its 2006 "Super Cool Edition" re-release. Big Hero 6 is a 2014 American 3D computer animated superhero film produced by Walt Disney Animation Studios and released by Walt Disney Pictures. Loosely based on the superhero team of the same name by Marvel Comics, the film is the 54th Disney animated feature film. Directed by Don Hall and Chris Williams, the film tells the story of Hiro Hamada, a young robotics prodigy who forms a superhero team to combat a masked villain. The film features the voices of Scott Adsit, Ryan Potter, Daniel Henney, T.J. Miller, Jamie Chung, Damon Wayans Jr., Genesis Rodriguez, Alan Tudyk, James Cromwell and Maya Rudolph. Bear Story is a 2014 Chilean animated short film directed by Gabriel Osorio Vargas. The screenplay was co-written with Daniel Castro and the film was produced by Pato Escala Pierart. The story is inspired by the director's grandfather, Leopoldo Osorio, who, after the Chilean coup d'état, was imprisoned for two years and then forced to live in exile for the duration of the dictatorship. The film was a critical success, winning the Oscar for Best Animated Short Film at the 88th Academy Awards. It is the first Chilean winner of an Academy Award and the first Latin American animation to win and/or get nominated for an Oscar.